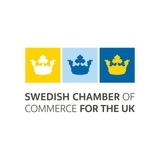 The Swedish Chamber of Commerce for the United Kingdom is the ultimate business platform for Swedish and UK businesses. We help businesses establish, grow and develop, through our wide range of business services, matchmaking, events and programmes. We represent 400 businesses, from start-ups, to SMEs, unicorns and large multinational corporations, from across all sectors and industries. Founded in 1906 - by businesses and for businesses - we have connected the Swedish-British business community for over a century. Join us today, if you haven’t already. Review’ and looked quite different from today. Nonetheless, the focus has remained the same - to be at the service of the Swedish-British business community. In the 1954 April issue, you could read a contemporary translation of the ‘Treaty of Friendship and Commerce’ between Sweden and the UK from 1654, an article about the conference of Sweden consuls in the UK and a guest column on how the British view current trade relations between the countries. Dear Members, 29 March has now passed, the 12 April is arriving, and Brexit is showing no signs of a conclusion (at time of writing this), despite an eventful month of indicative votes, rejected votes, negotiations, Parliament control, and quite frankly, a lot of drama. BBC Parliament’s viewing figures must have hit the roof. Businesses are now faced with a unique challenge on their hands, relating to the unknown, in a world where unpredictability has almost become the norm. At the Chamber, we offer a platform for businesses to meet, share, listen, and help each other. Since I joined the Chamber last summer, we have hosted numerous town hall events, intimate roundtables and put Members in front of decision makers or those in the know. We will continue doing so for as long as this process continues. We have also taken steps to connect Swedish entrepreneurs, start-ups and SMEs to the UK, in an effort to make sure we develop relations between our two countries, and not the opposite. Our London Bootcamp programme during London Tech Week is a partnership with the Swedish Agency for Economic Growth and will feature 35 Swedish tech businesses on their way out in the world. We are also launching a unique Growth Readiness Mentorship Programme, connecting tech businesses in Sweden with London-based investors. We want to provide real value for the next generation. Join us for the annual Tech Forum & Tech Fest at Google HQ on 13 June, and meet the Bootcamp delegates and many more. The impact of technology and the speed of transformation is extraordinary. This speed is perhaps nowhere faster currently than in Shenzhen, China. As a board member of Swedish Chambers International, I had the privilege of visiting both Shenzhen and Hong Kong this March. With technology comes enormous opportunities, and we met with a range of successful Swedish businesses and organisations in the region, such as Daniel Wellington, Flexworks, EQT, Handelsbanken, Nordic Innovation House and Viral Access, with various footprints in the Greater Bay Area region. Even the LINK is subject to change, and this issue brings you some new features. “In conversation” is one of them, where random Members are brought together to explore what unites them. Another is the “Patrons highlight”, looking at some of our biggest supporters. This issue will also launch our podcast activities, which will go online from April onwards. Exciting times. A warm welcome to our newest Members; Barreca Tibblin, Byredo, FIKA Communications, H&H Group, Hypergene AB, Invest in Skåne, LOGOS, LondonSwedes, Rawlinson and Hunter, Stora Enso, SVCA, Vaneo Capital and Zound Industries. Also, a warm welcome to our newest Patron Haypp. 5 Happy at work SCC Member and Patron Kinnarps, UK MD Ashley Hayward, on well-thought-out working environments. The first participants of ‘Making sense of Britain’ and ‘Making sense of Sweden’ have finished their courses. Read what they had to say. Christopher Fuchs, MD at Nefab UK, on the company’s journey to a global business with sustainability in focus. In February we welcomed our very first Business Service Manager to the team. Ashley Hayward, Managing Director of Kinnarps UK. The LINK PATRONS HIGHLIGHT agile working environment - or activity-based working - as the go-to solution for companies looking to find efficiencies in their property costs and/or improve the experience for their employees. He explains that agile working has many benefits including releasing expensive floor space whilst giving employees a more attractive working environment; allowing companies to grow without the need to take on more property; or getting teams to work more collaboratively and improving the workplace experience. “There’s a host of reasons and related benefits to consider, but it starts with an organisation’s goals and strategy, something we use Workplace House to help us extract and define,” says Ashley. However, he also points out that this is not the only option. “Our Next Office consultancy process is designed to help organisations find the right solution for them. This could mean ‘going agile’ but could lead them to take a more conservative workplace design route. Every client is unique, so we have no off-the-shelf answer. We work with clients to discover what will fit their individual needs and specifically help drive their business.” Workplace House is also a living example of co-working and through it Kinnarps is able to demonstrate in a real setting how its products play its part. “Whether commercially sold as co-working spaces or simply designed as such within large corporate entities, the move to sharing space, choosing from a mix of settings and rubbing shoulders with other professionals is the key driver to designing workspaces today,” says Ashley. Well-thought-out working environments Kinnarps is continuously working with communicating how a well-thought-out working environment has an impact on being happy at work, creativity, productivity and health. Even though there is a great deal of research and discussion around the topics of workplace design in relation to creativity and productivity of employees, Ashley thinks that some of the communication is often ‘preaching to the converted’.  The Patronship The SCC Patronship consists of a core group of SCC Member businesses committed to supporting the Swedish-British business community. The Patronship comes with a range of added benefits - if you would like to know more, please contact membership@scc.org.uk. Kinnarps recently launched its re-designed London showroom, Workplace House, displaying the benefits of agile working. Photos: Kinnarps. Scott Allen, Fagerhult, Min Lee, Löfbergs and Marianne Trotta, Fagerhult. Photos: SCC. Swedish. Many work environments have a constant buzz of social interaction, whereas the focused and efficient Swedes have scheduled fika breaks. This gives everyone an opportunity to take a break, spend time socialising and catching up with friends and colleagues. Although the food is incidental, the coffee has to be strong! The result being a happier and more productive team. Sweden for 18 months, phone lines were closed twice per day to make it possible for all employees to sit together. My idea for a productive and interesting “fika” meeting with fabulous cinnamon buns is to join forces in smaller teams, with an open mind as to who can and wants to join. Scott Allen and Marianne Trotta, Fagerhult. where they will be serving Löfbergs coffee. This is a place they will invite people to stop and recharge their batteries from the hustle and bustle of the fair. “We want to have this little fika haven during the Clerkenwell Design Fair. We want people to come and join us for a nice cup of coffee, a nice bun and we want to promote the concept of fika. It would be a very nice way to collaborate with each other again,” says Marianne. The SCC is continuously working with introducing Member companies to one another as well as helping with initiating collaborations. In the SCC network, the examples of Member companies who have found each other are many, and one of these examples is the collaboration between Fagerhult and Löfbergs. outdoors on a clear and cold winters day. When the sun reaches you, you can feel that spring is around the corner. You take a seat on large boulder, heated by the sun and open the thermos with coffee and unwrap the freshly made cinnamon rolls you have brought along in your backpack. You can picture it, can’t you? Almost smell it? THAT is FIKA for me. Swedish start-ups get a boost at London Bootcamp London Bootcamp is a one-week accelerator programme for selected Swedish start-ups and is the outcome of a new collaboration between the Swedish Chamber of Commerce for the United Kingdom and the Swedish Agency for Economic and Regional Growth (Tillväxtverket). “We want to create a launch pad for taking that big leap every start-up is dreaming of,” says Arash Sangari, Programme Manager at Tillväxtverket. From day one, the selected start-ups will be drilled in everything they need to know about scaling up their businesses. During the week, they will meet with leading experts, take part in group sessions, network and have individual meetings with hand-picked investors, all leading up to their pitch at Tech Forum on 13 June. Coaching from experienced professionals The programme features experienced professionals who themselves have successfully made the journey from startup to unicorn, and who will be coaching the participants for growth, investor-readiness as well as setting up and standing out in the UK. Tailored investor meetings As part of the programme the start-ups will get tailored individual meetings with investors, chosen from a roster of international UK-based investors. “Our aim is to give the entrepreneurs knowledge of the British market, an understanding of establishing in the country, and the opportunity to meet with high-level experts and investors. The ambition is that the participating start-ups return home with new business opportunities,” says Arash. Find out more about London Bootcamp at scc.org.uk/training/london-bootcamp. Arash Sangari, Programme Manager at Tillväxtverket. Photo: Tillväxtverket. Start-ups, unicorns and investors meet at Tech Forum How do start-ups go from being challengers to game-changing unicorns, and what role do investors play in that journey? On 13 June, the Chamber brings together startups, unicorns and investors at Tech Forum, to discuss the applications of technologies such as blockchain, AI, AR and VR - and what makes them successful. “It is our way to shed some light on the Swedish tech scene during London Tech Week,” says Peter Sandberg, Managing Director of the Swedish Chamber of Commerce for the United Kingdom. London is well-known for being one of the leading tech hubs in the world. In fact, according to a recent study by intelligence platform Quid, London is, together with Silicon Valley, topping the charts for start-up growth, global investment and research into the development of cutting-edge technologies. “Many Swedish businesses come to London to expand and raise capital. We created Tech Forum as a platform for tech businesses, startups and investors to meet and create new bonds,” says Peter. UK, Germany and the Netherlands, the largest number of unicorns in Europe. There is no doubt that the attractiveness of the Swedish tech industry is as strong as ever.” Tech Fest on Google’s rooftop As one of the highlights of London Tech Week, Tech Forum is succeeded by Tech Fest, hosted by Google on their rooftop. The event promises networking opportunities with tech companies, investors and features a pitching session with the participants of London Bootcamp. Find out more about Tech Forum at scc.org. uk/events/list/tech-forum-scaling-futuretechnologies. This publication is for informational purposes only. It does not constitute a financial promotion. Our London contacts are available to introduce you to the Private Banking network in SEB, but Private Banking services such as asset management are not provided from the UK and therefore any contractual relationship will be with the SEB entity actually providing such services. Please be aware that the value of investments can go down as well as up. Past performance is not necessarily a reliable indicator of future performance. Future returns are not guaranteed and a loss of principal may occur. 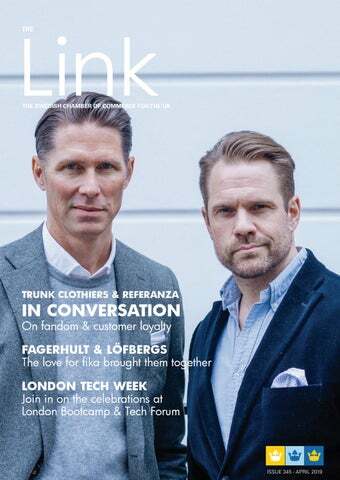 Mats Klingberg and Joakim Turesson outside Trunk Labs in Marylebone, London. Photo: Renz Andres. had a more tightly edited selection of clothes and that made it easier and more enjoyable for men that have very busy lives but still want to dress well, to find those pieces that were missing in their wardrobe. Trunk has been growing steadily since then. I have two shops now on Chiltern Street in London. Many of my customers are from London but many of them also come from LA, New York, Stockholm, Paris and Hong Kong. Since a while back I have a shop in Zürich, three shop-in-shops in Hong Kong, one in Shanghai, and I’m opening in Chengdu this autumn. Joakim: We started Referanza almost four years ago with the goal to turn satisfied customers into fans or ambassadors. With our platform, we find people that are very high on their experience, today mostly within sports and entertainment, and having them talk about their experience and hopefully influencing their friends to do the same thing. We are growing steadily in the Nordics, but I’m in London now since we see London and the UK as a major market. Entertainment and sports are huge here. We’re now partnering with Ticketmaster, the biggest ticketing platform globally. Joakim Turesson (left) and Mats Klingberg (right) at the SCC. Photo: SCC. What we must do now is to prove our platform in other markets. It could be interesting for us to collaborate on men’s clothing for example. I mean, we know that friends trust their friends, so that’s pretty much what it’s all about. On fandom and customer loyalty Mats: For me it is new to talk about fans. Of course, I get it, and I will start thinking about my customers and look at who the fans of my business are. The way I would define it is that a loyal customer is someone who shops with my business on a regular basis. A fan is someone that spreads the word and talks about how great I am. It might not be the highest spending customer but it’s someone that is an ambassador and a good spokesperson for what my business is all about. What do you think Joakim? Joakim: I totally agree. Every business has customers. You might have the satisfied customers, but then if you have customers that are so happy and satisfied with what you are doing, you can actually turn them into fans. As you said Mats, a fan is a spokesperson for a brand or a thing that they bought or experienced. I guess that the main difference would be a customer, a super satisfied customer and a fan that goes beyond that. But as you said, a fan doesn’t need to be a customer themselves. You can have a fan that hasn’t experienced your menswear. Instead, someone has seen your clothing on Instagram, loves it and talks about it. Today you can create fans just by being very active on social and in conversations with potential customers. Especially in the ticketing industry, people are starting to talk about things that they are going to attend. Just out of the fact that I’m going to do it, is a really good conversation starter. Mats: And of course, historically this was done by word-of-mouth, which is still very much the case for my business. This is where your business presents the opportunity to track, analyse and orchestrate it behind the scenes, to keep the conversation and dialogue going. That is something I will think about; how can Trunk get better at word-ofmouth in the digital world and take it to the next level? Joakim: Speaking of customer loyalty, what we’re seeing now is a totally new version of customer loyalty. It has up until now been about how much a loyal customer spends. Instead, we’re moving into an era of greater ‘social loyalness’, where the currency is not in pounds or in kronor, it’s rather in likes or shares or in presence in social. An interesting thing is how you can turn the offline purchase and the offline customer experience into a growing digital business. That would be very interesting to collaborate on. Mats: For sure. With your system, we could get more systematic about how we work with the customers we have. So I’m interested to continue this conversation beyond this session. On word-of-mouth marketing Mats: I think, just by doing a Google review, you’re not really targeting your friends. This is where direct messaging channels like WhatsApp are quite relevant now. Maybe there will be other ones like this in the future. I don’t know, would people have their own Referanza app to share their thoughts with their friends? Or would you partner with WhatsApp for instance? Joakim: We are partnering with WhatsApp, Instagram and Facebook, but it’s a very interesting idea. In our case, since we consider shares and recommendations as a social currency, how can you use that social currency to buy airplane tickets or change it into a bottle of shampoo? An app would definitely be a way to move forward with that. Mats: And generally, it is people who like what you do that want to refer to other customers. There are a lot of negative comments out there on TripAdvisor and other sites. It’s a very wide spread of comments and it’s incredible how many both positive and negative comments you get. This is where it’s been quite challenging when it comes to word-of-mouth in the digital world. I’m all for that the customer is king, but to some degree this comes down to the internet over all. It’s gone a bit out of control, and I think you need to insert some decency and common sense in there as well to make something good out of it. On target groups Mats: We probably have lots of similarities and maybe differences. My target group, they are generally between 35-55, they are educated, they are in senior positions in either their own companies, or in a big global organisation and they travel the world frequently. Who is your customer? Joakim: I would guess that your customers are the perfect customers of our customers. We know for a fact that a person that buys a specific brand of clothing, is also test driving a specific car and is also buying pretty expensive arena tickets. I would look at it from a bigger perspective. I think it would be good for different brands that have the same kind of clients, to start working in new collaborations. It might actually be that some of our clients, the ticketing companies that we work with in music, theatre or in sports, would be a perfect match for you to work with. I would guess that the same kind of customers that you might have in your store, are a good social word-of-mouth target group. Some of them haven’t had Facebook for more than a couple of years. They might have 10, 30 or 100 followers, but they are very homogenous in their way of talking to each other so recommendations and referrals in that case are extremely high-converting. Why is that? Again, I trust my friends. Mats: In general, these guys have closed Instagram accounts. I believe that most of my customers are not influencers in that sense. We’ve been looking at our customer base and we’ve not really come across any influencers. But they do have their own accounts where they share information with their friends. You don’t necessarily see them in your own database but they’re obviously there. They have smaller groups of followers which means that maybe they’re even more loyal than those with 100,000 followers. Joakim: You just came up with a totally new word for us – ‘friendfluencer’. Mats: Did I say that? Joakim: Or ‘fanfluencer’. That might be the new influencer. Mats: Yes, because that’s very different. I wonder how long these influencers can stay relevant. There are obviously so many paid partnerships and it’s not really genuine. A lot of these influencers are getting away with it now, but I wonder how long will that last for? I’m not sure. And maybe they need to be replaced by ‘friendfluencers’. Rounding up Mats: This has been a great conversation. Thanks to the Chamber for bringing us together. Obviously we are in the same space. We all need customers and to spread the word. To be able to communicate and spread the word of Trunk is something I’m looking at and how I can do it better. I haven’t been great historically in digital and this could provide a great opportunity for Trunk. So, I’d like to continue this conversation going forward. Joakim: Me too, definitely. Since we’ve done so much within digital, it’s fascinating and exciting to look at the offline world and how we can turn the offline experience to online. I’m also very interested in keeping in touch with and talking to Mats, also being a successful entrepreneur, who’s put up stores in different countries. I’m looking back at the thresholds that we have in our business to grow organically, hopefully in new markets. I’m sure you also have a couple of tips and tricks up your sleeve, the ‘what to do’s’ and ‘not to do’s’, such as how you would enter a new market, especially here in the UK. I’m really looking forward to getting your expertise and experience on that. At Trunk Labs in Marylebone, London. Photo: Renz Andres. Course participants at the ‘Making sense of Britain’ course. Photos: SCC. Alexander Goodwille, CEO of Goodwille. Photo: Goodwille. The location that you choose for your new UK office is very important to your success. There are a number of factors to consider, including whether your business is sales or product driven. You must also research potential talent pools, since recruiting the right staff will be essential to the success of your new venture. Ease of travel by road, rail and air are also very important aspects of your location to consider, especially if you are intending to commute regularly from Sweden. Logistics are also very important if you have a product to distribute and locating your business somewhere central to the main motorway network may also be something that is important from both a practical and costings perspective. There are often government grants available, designed to attract businesses to certain regions, so it can be worth looking at cities other than London. It’s beyond important that you invest as much time as possible to understand your new marketplace. It sounds obvious, but the expansion process can be easily stalled by unexpected issues. Learn how the UK market operates and what it requires. Not only will it make your entry as seamless as possible, it will also give you the best possible chance to achieve success in the long run. Consider every aspect of your operation from supply, through delivery, and into customer aftercare. Make sure you spend enough time in the UK and get to know the new market properly. Do not underestimate the importance of local partners, like Goodwille, that can guide you through local regulations and introduce you to the right people! To find out more about how Goodwille can support you with your UK expansion, or existing UK operation, please contact me directly on alexander.goodwille@goodwille.com. Hemgården, where Sigurd Nordgren founded his carpentry. Photos: Nefab. working to ensure that they are on the forefront of new environmentally friendly materials. “These initiatives are very important to us,” Christopher says, “and I think that a lot of people that work for Nefab, regardless of nationality, are working here because they stand by these values.” When asked if Nefab’s Swedish roots could have affected these initiatives, he answers: “Absolutely. I think it’s almost baked into the Swedish mentality”. In that sense, he says, Nefab stays true to the values established by the carpenter’s sons in the forests of Runemo. Nefab’s Life Cycle Analysis calculates the environmental impact of their packaging solutions in order to reduce customers’ overall carbon footprint. BUSINESS BREAKFASTS INTIMATE ROUNDTABLE DISCUSSIONS FOR PROFESSIONALS In October last year the Chamber organised its first Business Breakfast – a concept that brings together a wide range of great speakers with tailored and differently composed intimate groups of professionals for interactive roundtable discussions. Diverse speakers and topics Since the start, the Business Breakfasts have featured diverse speakers like Neil Cassley, Senior Communications Manager at PayPal, Mark Prisk MP and Iain Macbeth, Head of Foresight, Transport for London, sharing their knowledge and initiating discussions on subjects such as PR and marketing, Brexit and the future of transportation. Catering to the many requirements of the Members “The purpose of the Business Breakfasts is to present a variety of themes and topics, that cater the many requirements of the Members. Whether you are a CEO, HR professional or a Legal Advisor, there will be a Business Breakfast with enlightening discussions that suits your interests,” says Anna Ericsson, Events and Programmes Manager of the Swedish Chamber of Commerce for the United Kingdom. Upcoming Business Breakfasts Some of the upcoming Business Breakfasts feature Martin Ingemansson, Managing Director Nordics at Facebook, Michael Sheren, Senior Advisor, Bank of England and Kristina Lindhe, CEO and Creative Director at the Lexington Company. Curated participant lists To attend a Business Breakfast, you need to register your interest on the SCC website. Participant lists are curated with the theme of each Business Breakfast in mind, for all attendees to get the most out of the discussions. See all upcoming Business Breakfasts at scc.org.uk/events. LINK UP DRINKS AT GOWLING WLG 13 FEBRUARY The first Link Up Drinks of the year were hosted by Gowling WLG at their riverside offices, with beautiful views over London and the river. As is customary at the Link Up Drinks, new Members of the Chamber introduced themselves during the evening, thereamong BKL, Casall, Verdane Limited, North Star Law and Vaneo Capital. Throughout the evening, guests were offered to taste a wide range of different wines, including some delicious British bubbles. MENTORSHIP MEET-UP 5 FEBRUARY The SCCâ&#x20AC;&#x2122;s Mentorship Programme offers a unique opportunity for young professionals to take part in a twelve-month programme with individual mentoring by experienced senior industry professionals from across the SCC network. The first meet-up between the Mentors and the Mentees was kindly hosted by Handelsbanken Wealth Management. Programme Director Dr Aarti Anhal welcomed the participants before they engaged in workshops, speed dating and networking. BUSINESS CULTURE FOUNDATION COURSES 7 & 8 MARCH In March, the Chamber welcomed participants to the new SCC Business Culture Foundation Courses ‘Making sense of Britain’ and ‘Making sense of Sweden’. The aim of the courses is to give participants insight into both Swedish and British business cultures and provide the necessary tools to excel in each country’s workplace environment or corporate structures. The speakers provided tools, learnings and nuances in British and Swedish business cultures, and shared their personal stories about misunderstandings and situations caused by cultural differences. Upcoming events  Nordic Drinks 25 April | The Rembrandt Hotel, 11 Thurloe Pl, London SCC Member Price: FREE YP Member Price: FREE Non-Member Price: FREE For the first time, the SCC will join forces with the Norwegian, Finnish and Icelandic Chambers of Commerce and the Danish UK Association in the UK for Nordic Drinks and we welcome all our Members and friends to join us. 16 April | Nordea, 5 Aldermanbury Square, London SCC Member Price: £25 Non-Member Price: £50 Lisa Poole joined Vattenfall, one of Europe’s largest generators of electricity and one of the largest producers of heat, in early 2018, after having served as Director of Public Affairs and Policy at Centrica plc, as well as Director of Public Affairs at British Gas. The discussions will be chaired by Chris Philipsborn, Managing Partner, Kreab London.  MEET Johan Lundgren, CEO of easyJet 07 May | Aquavit, 1 Carlton St, St. James’s, London SCC Member Price: £45 YP Member Price: £45 Non-Member Price: £90 With over 30 years of experience in the travel industry, Johan Lundgren joined easyJet on 1 December 2017 as Chief Executive Officer. Since joining, he has made significant investments in data as well as AI to enhance the customer proposition, reduce costs and complexity, and increase revenue. Seize this opportunity to meet Johan and take part in an interactive discussion at Aquavit in central London, where food and drinks will be served throughout the evening. 25 April | DNB Bank, The Walbrook Building, 25 Walbrook, London SCC Member Price: £25 Non-Member Price: £50 Get insights into Facebook’s expansion in the Nordic region in this Business Breakfast featuring Martin Ingemansson, Managing Director Nordics at Facebook. This is an intimate roundtable discussion where you have the opportunity to interact with Martin and the other participants. The discussions will be chaired by Axel Berning, Head of Corporate Banking CEMEA at DNB Bank London Branch. 09 May | SEB London, 1 Carter Lane, London SCC Member Price: £25 Non-Member Price: £50 Andrew Mitchell was appointed Her Majesty’s Trade Commissioner for Europe in July 2018. Andrew is responsible for the British Government’s work to promote trade and investment with 32 countries around Europe. The event aims at discussing his views on future trade and impact on the relationship between Sweden and the UK. 21 May | DNB Bank, The Walbrook Building, 25 Walbrook, London SCC Member Price: £25 Non-Member Price: £50 We have the great pleasure of featuring Michael Sheren, Senior Advisor at the Bank of England, in this Business Breakfast on the financing of the transition to a sustainable global economy.  Tech Forum - Scaling future technologies 13 June | Google UK, Six Pancras Square, Kings Cross, London SCC Member Price: £45 YP Member Price: £45 Non-Member Price: £90 How do start-ups go from being challengers to game-changing unicorns? What role do investors play in their journey? At this year’s Tech Forum we explore the future tech landscape as we bring together start-ups, unicorns and investors to discuss the applications of blockchain, AI, AR, VR and other technologies, and what makes them successful. Tech Fest will follow the Tech Forum on the rooftop of Google HQ.  Link Up Drinks with BYREDO 21 May | BYREDO London, 40 Lexington St, Soho, London SCC Member Price: FREE Non-Member Price: £30 Welcome to our Link Up Drinks, hosted by BYREDO at their flagship store in Soho. This event promises excellent networking opportunities, Champagne and canapés. As is customary with the Link Up Drinks, new Members of the Chamber will introduce themselves during the evening. 25 September | DNB Bank,The Walbrook Building, 25 Walbrook, London SCC Member Price: £25 Non-Member Price: £50 Kristina Lindhe is the Founder, CEO and Creative Director of the Lexington Company, a global lifestyle brand represented in over 20 countries with a wide range of home and apparel products in its portfolio. Join this roundtable discussion and hear about her journey, and how it links with export, leadership, digitalisation, and her take on what traditional brands need to think of now. Please save the date for the 112th Annual General Meeting. The AGM (Members only) will be followed by a buffet lunch (non-Members welcome). team. I saw the unique opportunity to be able to contribute to establish and grow Swedish and British businesses, a great combination of the two countries that I consider being my home(s). I also saw a great fit for my experience and interest in entrepreneurship and tech development. The Chamber is such a great platform to nurture innovative companies, support with tools, guides and provide valuable connections to support their focus and growth. Photo: Renz Andres. SWEDISH FIKA? OR A NEW JOB WITHIN FINANCE? WE CAN GIVE YOU BOTH! Together with four Swedish Michelin-starred chefs, SCC Member Visit Sweden is launching ‘The Edible Country’, a 100-millionacre-DIY gourmet restaurant, in an effort to highlight the wealth of natural food that Swedish nature has to offer. The restaurant’s menu consists of nine courses that visitors cook themselves from ingredients found in the wild at wooden tables that have been placed in different locations across the country. A collaboration between National Garden Scheme (NGS) and ‘Gardens in West Sweden’ will see a Swedish public garden built in Saltwell Park, Gateshead - one of the top ten parks in the UK. “Our nature is filled with edible ingredients and we want to invite the world to enjoy them, and at the same time wind down in nature like us Swedes do. By using our star chefs’ menu, this new and innovative DIY culinary experience makes it possible for visitors to explore and transform nature into gourmet food themselves,” says Jennie Skogsborn Missuna, Chief Experience Officer at Visit Sweden. The garden marks an important step in the development of a closer relationship between West Sweden (Region Västra Götaland) and North East of England by providing spaces for educational, economic and cultural exchange between the regions. A relationship that marks its 10th anniversary this year. The Swedish community and its British friends will be able to use the garden for social and business events. The biodiverse garden will attract pollinators like butterflies and bees, and visitors will be able to enjoy elements from Western Sweden’s coastal landscape, a meadow area and a woodland. The garden, which is planned to be permanent, opens its gates for the public in August. SCC Member Husqvarna UK Ltd is one of the project’s main sponsors. Sweden gets its first new airport in 19 years In December 2019, Sweden will get a new airport for the first time in 19 years. In the midst of Sälen’s mountains, the ‘Scandinavian Mountains Airport’ is being built on a small airfield on the Swedish side of the border to Norway. According to the CEO of Scandinavian Mountains Airport, Brett Weihart, the infrastructure is state of the art and will provide accessibility right in the heart of the region that hosts Sweden’s and Norway’s largest alpine destinations. “With improved infrastructure, we take another step in the development of the new large region that is growing. Through better accessibility for both Swedish and international guests, we contribute to increased growth and more jobs in the region, while helping other stakeholders expand their business,” says Brett. Lord Adonis has kindly invited us to the UK Parliament for a discussion on Brexit and the future of the UK. Members-only. Join us for the Nordic Drinks at the Rembrandt Hotel. The event of the year is getting closer. YP 25 will be something out of the ordinary so bring your friends and help us make this into a fantastic event. Stay tuned for more information. How do start-ups go from being challengers to game-changing unicorns? The Tech Forum is part of the SCC’s London Tech Week programme events. We welcomed both loyal YP Members and their friends to the Spring Kick Off at Albertâ&#x20AC;&#x2122;s at Beaufort House. It was a lovely event and a great way for all the attendees to meet and network with other young professionals living in London. We were invited to the offices of the full-service digital marketing agency Adwaiz, to learn all about social media. We were challenged during the workshop to create a marketing strategy for a new up and coming phone app. Thanks to Adwaiz for hosting us and to everyone who joined us during the evening. We were invited to Kindred Groupâ&#x20AC;&#x2122;s offices in Wimbledon, the workplace of one of our YP Members. We networked and listened to interesting presentations on the online betting industry. Thanks to Kindred Group for hosting us and to everyone who joined us for this company visit! On 20 March we visited the law firm LOGOS. During the evening we enjoyed insightful presentations, networking, food and drinks. Some of the themes highlighted were differences between Swedish and British business law, Brexit and the importance of negotiation skills. Many thanks to LOGOS for hosting us and to everyone who came. Svenskt kaffe & hembakta kanelbullar, svenska dags- och veckotidningar. Här finns alltid någon att prata med! Fritt WiFi & gästdatorer med skrivare. Anslagstavlor med tips på boende, jobb och vad som händer. Ung i London, Öppet hus/Stay & play, Syjunta, soppluncher, lunchkonserter, Seniorträffar, föredrag, utställningar. Alla-kan-sjunga-kör, barnkör, kyrkokör, seniorkör. Gudstjänster, dop, vigslar och konfirmandundervisning. Se webben för mer information! for printing services – in fact you’re looking at our printing NOW! Camilla Carlbom Flinn, Chairman at Carlbom Shipping Ltd. The Humber Chapter of the SCC is located in Immingham and opened in the 1990s. The Chapter is one of four alongside the Midlands, Northeastern and Northern Chapters. Camilla Carlbom Flinn, Chairwoman at Carlbom Shipping Ltd, was appointed the Chapter’s Chairwoman in 2008. NEW MEMBERS AND PATRONS The Swedish Chamber of Commerce is the ultimate business platform for Swedish and UK businesses, representing 400 companies from across all sectors and industries, and from start-ups, SMEs, unicorns to large corporations. Membership comes with a suite of benefits for you, your colleagues and your business. If you would like to find out how you can maximise your membership, or to enquire about joining, please do get in touch at membership@scc.org.uk. But first, a warm welcome to our newest Members. New Patron Haypp We offer the world’s largest All White selection online. We make sure the product is fresh. We make sure the shipping is fast. We make sure the price is competitive. We make sure to sell and brand our All White, the new kind of stimulation, in the most responsible way. We are Haypp! Our mission is to market the new generation of nicotine products that offer a healthier and more satisfying alternative than cigarettes – The All White. It is a nicotine pouch for a convenient and recreational use anytime and anywhere, with zero tobacco. New Members Barreca Tibblin Emilie Barreca and Maria Tibblin formed Barreca Tibblin Ltd in 2018 following over 20 years combined experience in the industry working for Candy & Candy and Ralph Lauren amongst others. Barreca Tibblin is a luxury interior design company, working with private clients mainly in Europe on high-end residential and hospitality projects, as well as yachts and jets. BYREDO BYREDO is a modern European luxury house founded in 2006 by Ben Gorham. In contrast to Scandinavian aesthetics, BYREDO carries clear ethnic influences from Ben’s Indian background with strong ties to creativity, art and lifestyle and has established a unique position in the market. The BYREDO catalogue consists of home candles, fragrances and a collection of handbags and small leather goods. H&H Group H&H Group is a long-term owner of successful communications companies safeguarding the entrepreneurial spirit and giving every agency freedom to become even more successful. Agency revenue amounts to SEK 550 million with more than 450 employees in Stockholm, Malmö, Linköping, London and Shanghai. Agencies: Hallvarsson & Halvarsson, Comprend, Springtime-Intellecta, Identx, Jung Relations, Creo, Tomorrow, Involve, Consilio, Bysted, Savvy, BerntzonBylund, Mindmakers, Socialminds and Wonderland. Hypergene Hypergene is a tech company in the Business Intelligence and Performance Management market - with a cloud-based product for planning, reporting and analysis. With Hypergene you can streamline your budget and forecasting processes, follow up on operations using advanced analysis and reporting functionality, and work with strategic management. We are a fast-growing company with 170 employees. Invest in Skåne Invest in Skåne is the official business promotion agency for Sweden’s southernmost region Skåne. We provide professional advice and services to international companies considering Skåne for future investment or establishment and assist local companies with trade and export. Our regional strongholds include Design, Digital Games, Food and Packaging, Life Sciences and Materials Science. LOGOS LOGOS’ highly-committed transactional and advisory team (many of whom are dual-qualified) in London offers dedicated legal services for their Nordic clients and has a strong track record from most of the Nordic markets. Clients report that LOGOS’ lawyers are pragmatic, commercially astute and adept at bridging any cultural gaps between the different legal systems. LondonSwedes LondonSwedes is the biggest community of Swedes in the UK with over 50,000 members. The website and social media channels have become the go-to-place for Swedes living in or relocating to the UK when in need of information and Swedish events. They can help you organise your Swedish themed company events or help you reach out with your products and services to the Swedish community. They also recently launched a job platform and a small co-working space called The Moose Loft. Rawlinson & Hunter Rawlinson & Hunter is an international grouping of professional firms that provides advice to high net worth individuals and families with planning tailored to each client’s needs and objectives, backed up by first rate trust, tax and accounting services. Their offices stretch from London to New Zealand to Switzerland, Bermuda, the Cayman Islands, the British Virgin Islands, Singapore and Australia. Stora Enso Stora Enso is a leading global provider of renewable solutions in packaging, biomaterials, wooden constructions and paper. We believe that everything that is made from fossil-based materials today can be made from a tree tomorrow. Swedish Private Equity & Venture Capital Association SVCA is the industry association for the private equity industry in Sweden. Among other things, they act as the advocate for the industry in the media as well as with politicians and decisionmakers. They also monitor changes in regulations and tax legislation as well as promoting a favourable environment for the industry. Zound Industries Zound Industries design, develop, manufacture and market headphones and speakers. Their mission is to create unique experiences in the intersection between lifestyle and tech that enrich people’s lives. With a genuine passion for new technologies and user centric innovation they aim to create products that define our time. Zound Industries has a portfolio of distinctive brands; Urbanears, Marshall and Adidas. Financial planning - not one size fits all In addition to the organisational design, the wellbeing of Handelsbanken’s customers is at the very heart of Handelsbanken’s business. Tracey says that for Handelsbanken it’s all about building a long-term relationship via whatever medium best suits the customer. “15 years ago, the only way that clients would have received wealth management services would have been face to face. Today there are more options available. Financial planning is not ‘one size fits all’. Sometimes you need to sit down and talk to a human being but sometimes you’re happy reviewing your financial planning on your phone at night, home in your pyjamas with a warm cocoa,” says Tracey. In order to meet this evolution, Handelsbanken last year launched a new industry-leading digital investment reporting tool which gives clients an up-to-date view on what is happening with their investment portfolio, what changes have been made, up-to-date commentary from the investment team and an ability to analyse the portfolio performance; a really dynamic experience. with people have played a big role. “Interacting with people and seeing them succeed as well as a love for the mechanics of business are two of the best things about my job”. Tracey explains that the pace and responsibility that come with her role give her both adrenaline and positivity. She believes that some people would call this stress, but she likes to look at it as a “healthy, good kind of stress”. She says: “I thrive on it, I enjoy all of it and I love seeing things work.” Tracey is constantly looking for the next thing, for new ways to improve and thinks that sometimes the greatest challenge can be to leave things alone. “For me sometimes the hardest thing is to sit on my hands; I have to let people do their job. I have some superb, talented colleagues at Handelsbanken and I am very proud of what we achieve together; I can’t wait to see what we can achieve in the future”. When it comes to the development of technologies such as AI, Tracey’s view is that there is still a human element required when it comes to wealth management services and she is not yet clear on her opinion on AI in terms of delivering financial advice. “I think that whilst there are always people who will embrace new technological developments and who might be willing to take advice from or implement advice given by AI, it’s not something that we see a demand for amongst our customer-base today. Our customers tell us that the human interaction and the relationship element that they get with Handelsbanken is important, but they also like to have the digital tools to support it. We don’t think it’s one or the other, we think it’s a combination of both. We think this dual approach we offer is a USP.